Is there anything more gorgeous? Is there? Even though this picture just scrolled by me, it creeped into my subconscious and inspired me to plan my own trip to the French Riviera (in three weeks!). .....and wrote that they make "a perfectly simple burrata dish with zucchini, mint, and garlic", so obviously I had to investigate further.....and discovered that the bench is real!!!!! And it isn't in France! It's in Italy! And seeing as I don't leave a stone unturned, this is the burrata (although a different preparation)!!!! So after dealing with a wicked case of travel envy, I decided to to dig around the internet to check out some Cinespia photo booth pics, and discovered that they didn't recreate this bench at all! False Advertising!!!!! The Great Beauty - Rich lady's apartment where everything is expensive, but there is little of it. I know The Great Beauty (2013) is supposed to be a really good movie, but......... I didn't enjoy it. However, I do like this tile floor. The pattern is the right balance of geometric and floral. The tiles themselves have slight color disparities, meaning they are either old or a vintage style. There is a dark band around the base of the walls, which frames the pattern and highlights the scale of the room. The Devil's Double is a film inspired by the true story of a man forced into being the body double for one of Saddam Hussein's psycho sons. The movie was solid (and graphic). This hallway was the most dramatic set design moment. Notice how the tile on the walls are mirrored on the ceiling. The Escape Artist - Bathroom in at an opulent banquet hall. Just watched The Escape Artist, an awesome lawyer/stalker British mini series. Could someone explain to me what "making silk" means? Anywho, in the first episode David Tennant leaves his cell phone in a bathroom at a work event (right by the sink), and something about the bathroom really spoke to me. I love the band of green. And I love how the tiles have that slightly askew vintage quality. I love how the sinks are urinal-esque the way they jut out. And even the soap dispensers are working for me (something I never thought I would say). I loved the picture gallery on Remodelista on Jagged Edges. I have noticed this trend for a while, but didn't have the right words to express it. I always thought of it as highlighting raw materials, but jagged edges is better. As soon as I get a chance to redo a bathroom or kitchen, I am going to work in subway tile and dark grout. 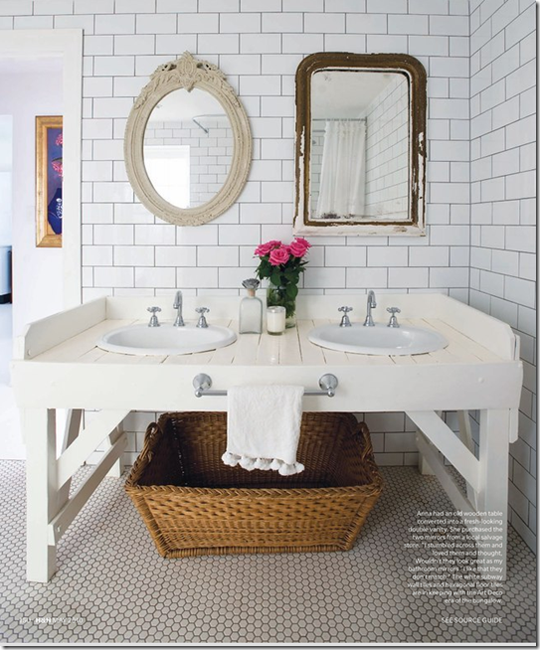 This style is called "subway tile" because it was used in the New York City subway stations in the early twentieth century. It is simple, classic, and inexpensive. It does not have to be paired with dark grout, but I like the added geometry of it. And I think it would be great for a bathroom because dark grout can hide a lot of scum. Note: DIY sites say dark grout can highlight sloppy work, so don't phone it in. Stoker (2013) - Surprisingly, the least creepy room in this house. Jeffrey Alan Marks used this look on the show Million Dollar Decorators when he redesigned the bathroom of his Crossfit gym. He said he likes the look because it reminds him of a 50's locker room in a boys prep school. This is now my fifth post about the FX show Tyrant, and I already know it won't be my last. Ridiculous! I should just rename this blog Titillating Tyrant and devote the whole things to screen shots and fan fiction. I just finished episode ten and there were two new sets that need to be mentioned. Tyrant: Season 1, Episode 10 - All marble bathroom. This is a room fit for two ignorant american princesses. Tyrant: Season 1, Episode 10 - No need to look at your watch Mrs. Al-Fayeed. You are already in paradise. Take me to the palace! I am really digging the tiled/wallpapered accent panels featured in the show, Tyrant. Tyrant: Season 1 - Office of the brother of a psychotic dictator. And the pièce de résistance: The office of a psychotic dictator. Already I am compelled to post more images from Tyrant. The show has taken a pretty melodramatic turn, but the decor is still spot on. I just watched the first episode of Tyrant, and wow. I mean wow. I haven't had a design-gasm like this since the first episode of Downtom Abbey (remember those indoor palms!). I was reading Remodelista, when I stumbled on an article all about patchwork tile. First of all, it's AWESOME! 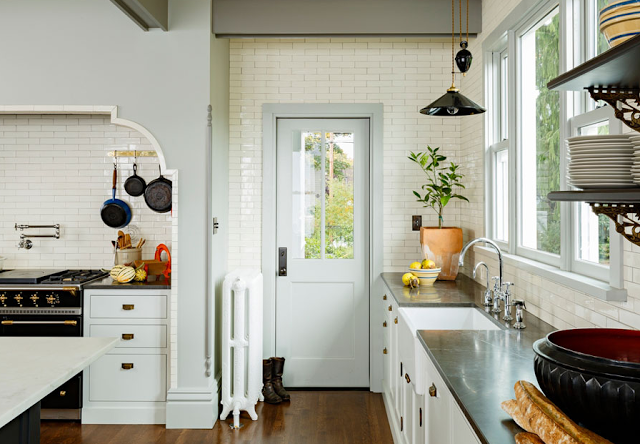 These kitchens immediately made me think of the kitchen set from The New Normal, which was going for a classic California Spanish Colonial feel. Umbrian home designed by Paola Navone, a mix of Moroccan tiles of her own design, fromCarocim. My friend took me on an urban-hike through Hollywoodland a while back, based off of the book Secret Stairs, by Charles Fleming. I then took Hillary on the same hike, and we oohed and aahed over everything. Different bands of Spanish tiles on each level. Yes Please. Impromptu mosaic. Don't mind if I do. Not sure who lives in this tree house. Narnian squirrels? A few days ago, I saw Vermeer's The Art of Painting at the Kunsthistorisches Museum museum in Vienna. It got me thinking about checkerboard floors, and how they are timeless. These floors are both casual and formal, classic and contemporary, simple and bold, and on and on. They work in your garage, in a ball room, and in your grandma's house. They even look good in linoleum. You can do them in tile, marble, wood, paint, carpet....sky's the limit.